Old map by PIRANESI -Veduta del Mausoleo d'Elio Adriano (ora chiamato Castello S.Angelo) nella parte opposta alla Facciata dentro al Castello. Title: Veduta del Mausoleo d'Elio Adriano (ora chiamato Castello S.Angelo) nella parte opposta alla Facciata dentro al Castello. Size: 17.1 x 22.0 inches. Condition: Good and dark impression. Fine: No chips or tears. Large margins. Fine early imprint and signed in the plate in lower right corner : Piranesi Archit.dis. ed inc.. In the center Presso l'Autore a Strada Felice vicino alla Trinità de'Monti. Giovanni Battista Piranesi (1720-1778) was an Italian etcher, draughtsman and architect. He was born in Venice on the 4th October 1720. In 1740 Piranesi left Venice for Rome and started to draw Roman architecture. 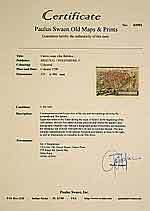 He studied etching under Giuseppe Vasi. With the help of Giuseppe Wagner, a successful engraver and publisher of Venice, he returned to Rome, where he had a workshop on the Corso. Most of his life was passed in Rome, etching, writing, publishing, and directing a workshop in which the restoration and sale of antiques played a considerable part. Although perhaps Piranesi?s most discussed etchings are those of his visionary Prison series (Carceri), his Views of Rome (Vedute di Roma), produced as single prints between 1748 and 1778, are his best-known mature works. 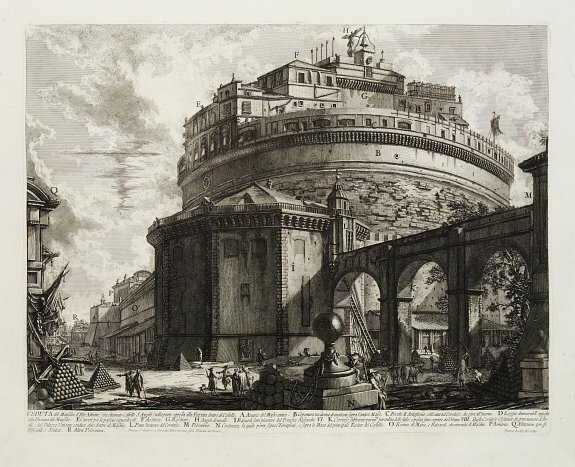 Comprising 135 large-scale etchings of the buildings of classical and post-classical Rome, these images contributed considerably to the city?s fame and to the rise of Neoclassicism in art, architecture, and interior design in the second half of the eighteenth century. Piranesi?s unparalleled accuracy of depiction, his personal expression of the structures? noble simplicity and calm grandeur (in the words of the art historian Johann J. Winckelmann), and his technical mastery made these prints some of the most original and impressive representations of architecture to be found in Western art. The present print appears to be from the Paris edition of 1800?1807. Following Piranesi?s death in 1778, his children carried on his publications in Rome until 1798. Two years later, the artist?s sons moved to Paris, taking with them their father?s original copper plates and from their new location reissuing his prints until 1839 when the Camera Apostolica bought the plates. A strong and desirable impression from his most important architectural series.